The association for the condominium, at 133 NE Second Ave., says fire sprinklers were blocked and would have malfunctioned if there were a fire. It also has alleged problems with the HVAC system. The Loft 2 condominium in downtown Miami was built with flaws such as plugged and malfunctioning fire sprinkler heads and defects in the heating, ventilation and air conditioning system, owners complain in a lawsuit. 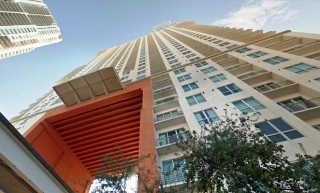 The 35-story condo tower at 133 NE Second Ave., notable for the Metromover tracks running through the building, was built in 2007 by Jorge Perez’s Related Group as part of its workforce housing projects that include the nearby 23-story Loft 1 at 243 NE Third St. The condo is in the urban core yet offers cheaper units than the luxury condos that remain unaffordable for working-class locals. But the building is mired in legal battles playing out in Miami-Dade Circuit Court. The Loft Downtown II Condominium Association Inc. twice has sued the Baltimore-based general contractor Whiting-Turner Contracting Co. and also names subcontractors in the lawsuits. Most recently, the association has sued Whiting-Turner and Doral-based fire sprinkler contractor Century Fire Protection Inc. alleging the condo wasn’t built according to plans and Florida Building Code standards, according to a Feb. 21 complaint. The Miami Fire Department on May 11, 2017, put an emergency fire watch on the condo association, according to the complaint. “These defects and deficiencies posed a major life safety issue because in the event an emergency fire (broke out) the blocked sprinkler heads would fail to operate throughout the condominium,” the complaint said. The association hired Miami-based Pistorino & Alam Consulting Engineers Inc. to inspect the building for construction defects, and its report said about 90 percent of the fire sprinklers were plugged. The latent deficiencies weren’t discovered until January 2017, according to the complaint. Bared & Associates attorneys Susan Granoff, Nicholas Mouriz and Pablo Bared in Coral Gables filed the lawsuit. They didn’t respond to a request for comment by deadline. The complaint lists breach of statutory warranties and breach of implied warranties, violation of minimum building codes and negligence counts against Whiting-Turner and Century Fire. Whiting-Turner, represented by Broad and Cassel partner Michael Wilson and associate Edward Philpot in Orlando, turned around and sued Century Fire saying any liability lies with the subcontractor, according to an April 23 third-party complaint. The two have an agreement that says Whiting-Turner will be held harmless and indemnified if issues arise with Century’s work, according to the third-party complaint, which lists contractual indemnity, common law indemnity, breach of building codes and breach of contract counts. “To the extent that the claims made by the association relate to the scope of work performed by Century Fire Protection have any merit, Century Fire Protection is solely at fault for such claims,” according to the complaint. The complaint said Century Fire Protection stopped operating and Century Fire operates in its place, although they are the same company. Cole, Scott & Kissane partner Kevin Schumacher and associate Matan Scheier in Miami, who represent Century Fire, didn’t return a request for comment. Calls to Century Fire also weren’t returned. The sprinkler lawsuit is the latter of two over alleged structural defects. The condo association previously sued Whiting-Turner and Miami subcontractor Weathertrol Maintenance Corp. first in January 2012 and then amended its complaint alleging shoddy work and defective materials mainly in the heating, ventilation and air conditioning system. Problems include defective longitudinal seam welds in the piping, an improperly cleaned condenser water system, lack of water treatment, premature unit heat pump failures, scaling and rusting of pipes and pipes not meeting minimum standards, according to a 2016 amended complaint. These issues have caused deterioration and damage of pipes, heat pumps, drywall and insulation, according to the complaint. It’s unclear if the alleged construction defects have caused problems for residents and, if so, for how many and to what extent. For one, the sprinkler head issue isn’t something the average person would notice and was fixed after the fire department’s notice, according to that lawsuit. The HVAC system and related problems, however, are alleged to have caused problems like peeling paint, water intrusion and other property damage. The amended complaint over the HVAC issues lists breach of implied warranties and breach of statutory warranties counts against Whiting-Turner, negligence and violation of minimum building codes counts against both Whiting-Turner and Weathertrol, and a violation of third-party beneficiary contracts count against Weathertrol. In turn, Whiting-Turner argued that some of the association’s claims are barred by the statute of limitations, the company’s work and materials met standards and the association might be liable for some of the alleged HVAC problems because it didn’t do routine maintenance, according to a response filed January 2017. For its part, Weathetrol in January 2017 filed a motion to dismiss the lawsuit and also has turned around to sue the piping distributor for providing defective pipes for the project, according to the third-party complaint. Numerous other companies that allegedly worked on the project, either providing labor or materials, have since been drawn into the lawsuit, which still is ongoing. A mediation effort in early 2016 ended with an impasse. Wilson, the Broad and Cassel attorney representing Whiting-Turner, declined to comment on the lawsuits. It appears that other issues with the condominium were raised in an Aug. 5, 2016, court document. It’s argued that there was a settlement between the developer, association and general contractor that settled issues with defects after a structural report. Whiting-Turner and Weathertrol, who filed this motion for partial summary judgment, argued that the settlement prevents the association from raising issue with some of the structural defects it named in its lawsuit, according to the filing. Developer Related, which hasn’t been sued over the alleged defects, declined to comment through a spokesperson.